192p. notes. Convergent. May 2018. Tr $25. ISBN 9781524760854. This incisive memoir takes a penetrating look at race and the Christian faith while providing tools on how to cope with microaggressions and blatant racism. 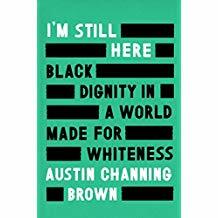 Brown perfectly and succinctly describes the corrosive weight of white supremacy embedded within American institutions, which African Americans and other people of color endure on a daily basis in schools, professional spaces, and places of worship. Brown's experiences and lifelong exploration of racial understanding and reconciliation offer a modern take on the double consciousness first written about by W.E.B. DuBois. From her days in elementary school, often as the only person of color in the room, to speaking on the national stage, Brown's lessons not only give allies the tools to do better but also provide advice for peers and up-and-comings on navigating hostile workplaces, lecture halls, and hearts and minds. This book is laced with gems that make it necessary reading for everyone, regardless of belief or identity. VERDICT Fans of Ta-Nehisi Coates's Between the World and Me and Reni Eddo-Lodge's Why I'm No Longer Talking to White People About Race will find this candid debut edifying and essential.